Steel Construction - 29,000 Sq. Ft. Creating a themed selling experience was the goal for this project. It was built in two stages –Phase I involved the renovation of an existing 14,000 sq. ft. auto dealership at the front of the property. Phase II – construct a 15,000 sq. ft. two story building and attach it to the front building to be used for gear, accessories and parts. This combined 29,000 sq. ft. space was designed for showroom, offices, lounge and parts storage. The front showroom has large full wall 70' ride scene murals creating a natural background for products on the show floor. The Clawson family's rich local history is incorporated by defining the customer's lounge with the original sign and gas pumps from their station. All of the details and materials used were in keeping with the theme and regional setting, including finishing the office fronts in weathered wood. 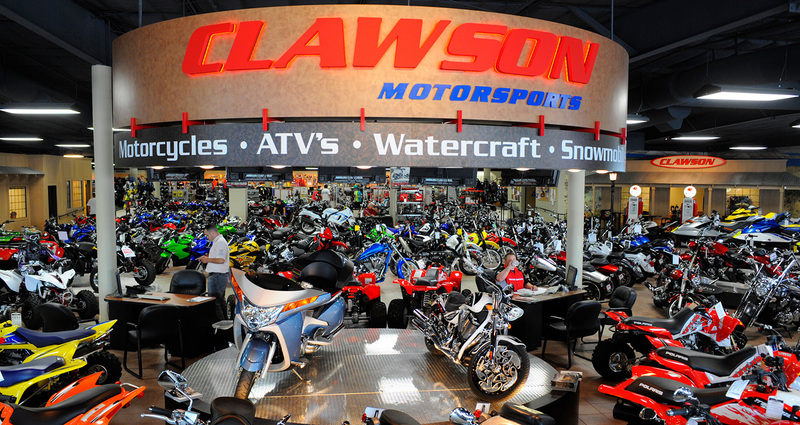 The second showroom houses an extensive gear and parts selling area, with a second story wrap around mezzanine.